I know there are some folks on Treeleaf including myself that use the 'Insight Timer' app on the iPhone/iPad/Android to track your zazen times. There's a new function that has been added to the app that allows the user to join 'groups' of other Insight Timer users. I've taken the liberty of creating a Treeleaf group that will allow us to more easily identify our fellow Treeleafers within the app. If you have no idea what I'm talking about, click here. Simply touch on the 'Insight Connect' button on the main menu. This will take you to the 'community' page where at the bottom of the screen you should see 'Groups', touch there. Browse the available groups until you find Treeleaf and join! Have fun. Last edited by Jundo; 11-04-2016 at 03:02 AM. thanks Siemyo, I've used that app exclusively for timing my sits for several months but wasn't aware of the new function. 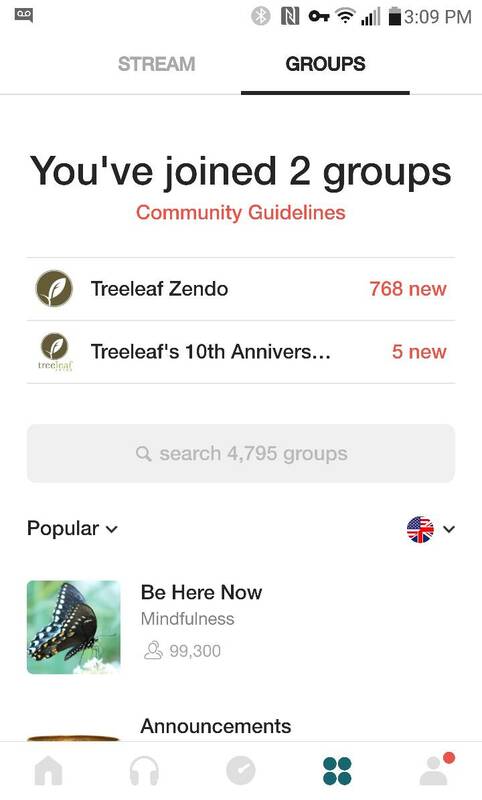 Browse the available groups until you find Treeleaf and join! I can get to the Treeleaf group page but don't see anywhere to "join group"
Same here. Found it but no join button. Thanks Seimyo! I've been using Insight Timer for awhile and love it. But I didn't know about that feature--really cool!--I'll look forward to sitting with all of you. Thanks Seimyo ... I have downloaded, installed, and connected to the Treeleaf Group. Finally was able to join. Thank you. Crappers, I have an older iPod touch; I can't download the app version that supports groups. but once I can I will, I use that time almost every time I sit. Thank you Seimyo! I've been using another timer app but I like the connectivity of insight timer much better! Wow this is cool! It's wonderful that so many different platforms all being brought together as this one whole we call Treeleaf! Great work Seimyo! Well I signed up but like some other posts there is no join button to connect with the Treeleaf group. Seimyo can you invite me to join please. I think this must be an iPad issue? Well I guess I just needed to sit and wait till the system logged me in. All is well and it is a great app, thanks. This is awesome, I'm setting it up right now! I use Insight Timer, but I'm usually offline when I sit. I'll keep at it until I'm able to join. It's acting up a bit at the moment. I only created an account with the app to join the Treeleaf group, but now I see I've missed out a bit. Now it's tracking the time I spend using the app for timed practice, which might be a "good" thing. I cannot for the life of me figure out how to join this group! I was mystified, but it turned out I had to just wait for a few hours before a [Join Group] button appeared when I visited the Treeleaf group page. Sorry. It does seem like their system takes a long time to update. Know that it will eventually show up. 1) On the start screen: Select “Insight Connect”. 2) Select icon “Groups” below on the screen that appears. 3) Scroll down. Select Search button. In field “Search Groups” enter Treeleaf. 4) “Treeleaf Zendo” is displayed on top. Select it. 5) On the next screen scroll down and select “Join this group”. Normally, I use a different app (Zazen Meditation Timer for Android), but from time to time I will use Insight Timer on my iPod touch (offline though). It did take time for the join button to show up. It is fixed now, thanks. I've been using Insight Timer on my Droids for a few years now and I love it. Creating a Treeleaf group was a great idea. Thanks Seimyo. Thank you Seimyo. I have joined. I've been having a nice time with this app. I've also been using the insight timer. Does generate a bit of a craving, but I recognize that and it will change as the time is appropriate. I've just been trying to set this up - is the Treeleaf group still there? I have the latest Insight Timer app on iPhone, but I can't find the Insight Connect button. And some options in the app are producing error messages (eg "The page you were looking for doesn't exist). Welcome to Treeleaf! Yes, we are still on there. I'm on a Kindle so my interface is different, but do you see anything that says "Groups"? It sure is ... Here is a screenshot on an Android device...hooe this helps. Thanks so much for the screen-shot - it showed me what was meant to happen! I'd tried the group icon (inbetween the timer and the person) and the app was giving me an error message instead of the screen you posted. The only question I'm left with is... why this app? Is the interactive component simply that after sitting you can post a message to the treeleaf group on the app saying that you sat? Or is there more to it? I've normally been using an app called Belfast Zen which has a much more minimalist interface which I like. Last edited by Taiten; 10-28-2017 at 05:18 PM. For me there are a few reasons to love Insight Timer. One is accountability, reporting that you did sit today. Another is offering your sit to others, in a way, encouraging and motivating them to sit too. Another is being able to see who's sitting - live - at the same time, which is a nice feeling. Also I just really like the bells. They're nice, and I can program a full zazenkai with bells and whistles and clappers and not have to fiddle with it. And it's also a little more casual atmosphere there, you can chat a bit about things you wouldn't necessarily start a thread for here, like, just the weather where you are, or how your day is, or your miserable cold, the kind of thing you'd chat about while walking out of the zendo maybe. I’d strongly suggest you turn the milestones off and ignore all the other statistics that IT provides. If you are like me you’ll find all the striving for achievement to be more of a hindrance than a help with your practice. Ah yes, the milestones! Lots of people find them motivating, some people find them oppressive. You can turn them off in the options. I have. PS - Insight is great. Weren't we also going to revive our old, minimalist, Treeleaf Timers? It might be good to just get those up on our homepage somewhere, just for people who do want just the "bells with no whistles." One is accountability, reporting that you did sit today. Another is offering your sit to others, in a way, encouraging and motivating them to sit too. I want to second Byokan’s observation here. IT has helped me with a little motivational boost from time to time (“but I don’t WANNA sit!”). For Ango last year I vowed to sit every day without fail. IT helped because of the accountability. Then they introduced the “365 days of sitting” group this year so I kept going to help motivate others in their practice. I find it positive, but if it seems too complicated or the “gold stars for sitting” is crazymaking, that’s OK too. I'll say this much for the Insight Timer. I dropped off the face of the earth for a while (like I do) and yesterday I was able to just log back in and sit in a connected way without much fuss. By this morning's sit, I had halfway figured out how it all worked again & saw that I had been sitting concurrently with a couple of leafers. Setting up to use a camera and getting into a hangout is a bit more overhead. Longtime Insight Timer user here. It is a great app. However, I recently switched to another app. It is a simple timer. Nothing more nothing less. Just bringing this up to let people know I am still meditating, but not on Insight. Well, I did try Insight Timer, but I've decided to go back to my old simple timer app. A few people mentioned that Insight Timer promotes "accountability". But what does that really mean? Worrying about what other people think about my practice and whether I sat today or not is something that I seek to let go of. I do not meditate because someone else told me to! Sometimes it is just an expression of the true nature and other times my "sensible head" says it would do me good. I think the point about others getting encouragement from your sit is good, though there are other ways to do this - posting here and saying Sat today, joining 2 way live sits, or sitting face to face with a local group; all these things I do. Oh believe me Syd, when I tell you that if I can do it... ANYONE can do it. For real. I am the least technological person on the planet. I don't even have a smartphone. Jump in whenever you're ready, you'll find lots of support here. Agree with you Nick, there are lots of ways to get ourselves to the cushion and lots of ways to support others. First and foremost is just getting the rump onto the cushion. Whatever works today to support that is the best way. Nice to see you again Syd! Hey Syd. How are the bochi balls rolling? I haven't had a chance to play lately, but I have been working on my really bad Korean. It's really bad. Last edited by Sydney; 11-22-2017 at 12:18 PM. It's good to be seen by you. Let's sit and/or chat soon. Thank you, very happy to join in. Is anyone able to explain how the Insight Timer works please? ....... Can people see each other when sitting and can people post ahead of time when they are going to sit, so others can join them online? And/or is it helpful in other ways? Unlike the more "interactive" ways of sitting together (such as the Free Sitting Room) with streaming video and audio, the Insight Timer app is a more informal tool. At its most basic it is simply a timer with nice bells and such for sitting. But can also provide social features ("friend" and "groups" -- including a Treeleaf group), daily sitting reminders, etc. A number of Treeleafers sit with IT most days. Its nice because when you open the app to time your sitting, if any of your friends, or people in your groups are sitting, you can see that fact (as text / icons though, not as streaming video or anything like that).